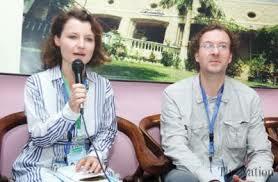 HYDERABAD: Tereza Lewis and Ingo Buettner, the long-term members of the European Union (EU) Election Observation Mission (EOM)-Pakistan 2018 on Friday visited the local press club to ascertain first-hand information about the July 25 general elections in Hyderabad. The observers explained to journalists the main objectives of the mission, saying that they were to support the democratic process in partner countries, to enhance people’s confidence in the electoral process and to help promote respect for human rights and rule of law. The club’s office-bearers Nasir Shaikh (president), Mansoor Marri (vice president), Rauf Chandio (general secretary) and others briefed them about the arrangements for the polling and scenario of contests among candidates on National Assembly and Sindh Assembly constituencies in Hyderabad district. Mr Shaikh expressed the view that the social media had emerged as a powerful tool while WhatsApp was being increasingly used by people for sharing information about all sorts of incidents, situations, developments and other happenings supported by video clips etc. He observed that there was a new trend of people approaching candidates directly through the social media to inform them about their grievances and express their views with regard to the state of their areas. The observers were told that candidates were facing problems in undertaking door to door visits within their constituencies as part of their election campaign. They were informed that there was no pressure on people [voters] from political parties or candidates as anyone could freely talk to the candidates without any fear which seemed to be a significant change in the election environment. EU’s mission is led by the chief observer, Michael Gahler, who hails from Germany.